Back view. For a change. It’s slowly beginning to dawn on me that if I wanted to work in a glamorous profession, perhaps archives may have been the wrong choice—at least as far as tv and Hollywood are concerned. When villainous Rutger Hauer shuts down Morgan Freeman’s special research department in Batman Begins, he transfers him to Archives—the implication being, this is a dead end for hope and ambition and rocket-propelled motorcycles. Now I see in Warehouse 13 that when the special agents are looking for a cover, they tell the secret service they work in … Archives. And the secret service make fun of them for being “filing clerks”, and warn them of the dangers of paper cuts. It’s officially spring so it’s snowing outside, a bitter north wind sweeping the flakes across the fields under heavy grey skies. It’s just a light dusting—think of icing sugar sieved over a chocolate cake—ah, damn, I just did and now my keyboard’s all wet—but it’s persistent. We went down to the harbour yesterday to watch the wind whip the waves in from the sea—not as spectacular as the great storm of a few months ago, but still pretty good, as the waves exploded against the harbour walls in showers of spray. Spring, eh? I’ve been in a knitting mood this last week, and have made pretty good progress, for me. I finished one cuff, picked up the stitches around the other armhole and am now about 5 inches down the sleeve. This is partly the result of getting my eyes fixed, of course, because I can now see well enough to knit while watching television—for the last six months it’s been one or the other. The shawl, she is finished. May have to redo the centre. Quickly. But sometimes I’m just in the zone, and enjoy the knitting as an end in itself. I definitely blow hot and cold over the duration of a gansey, sometimes I can hardly be bothered to lift a needle—other times, like now, it’s fun. You just have to hang in there through the bad times. I suspect Michelangelo felt much the same over the four years he painted the Sistine Chapel; except in his case he had the motivation of a monetary reward for success, or the threat of the Inquisition and excommunication and/or eternal damnation if things didn’t work out—so no pressure, Mike, knock yourself out. I should finish the sleeve in the next fortnight or so, and then it’s scissor time. I’m still mulling over what patterns to try next, as I do towards the end of a project; whatever I finally decide on, you can bet it’ll be simple, after this one! I keep careful records as I go, so I know that I have exactly the same number of stitches on my needles at this point as for the other sleeve, and am knitting the exact same row of the pattern. You have no idea how reassuring this is! I won’t get so much done this next week because I’m away in Edinburgh from Sunday to Tuesday, attending my last meeting of the Archives and Records Association Board as Vice Chair before stepping down (so I may not be able to respond to any comments for a few days). Which makes me wonder—if other people get sent to Archives when they’re demoted, where do archivists get sent…? Oh! Margaret! You put us gansey knitters to shame! The lace is exquisitely stunning! 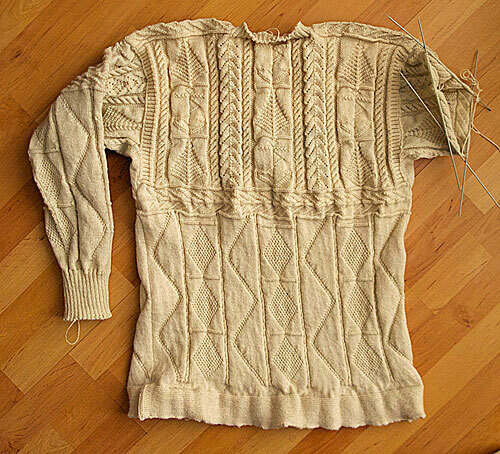 Great progress on the gansey, Gordon, the pattern down the length of the sleeve really looks nice. Archivists go to Field Work. Trust me, you don’t want to go to Field Work. I hope that you will knit a Navy coloured gansey. Otherwise the nice pattern will disappear in a black hole :). Hello to the wonderful Wick knitters, you do such nice work! Margaret, do you think that little bit of extra fabric will disappear as it rounds the shoulders of the wearer? I love your phone pouches by the way. Archivists, the secret superheroes! Is that why you have disguised lightning bolts all over the new gansey? Hello all, our fields are covered with snow just now, so any work in them would involve a shovel. Am I close? Archivists as superheroes? Only if cataloguing documents and translating Latin count as superpowers (probably, nowadays!). Quick, to the Archivemobile! Someone somewhere is struggling to identify an exemplification of common recovery! Where’s my pencil? Gordon, I think gansey patterns are the best in light colours. That is the reason I thought on the black holes-and baby universes – I admire Stephen Hawkings. Best regards from Finland- we still have about 80 cm snow in the southern part of the country. 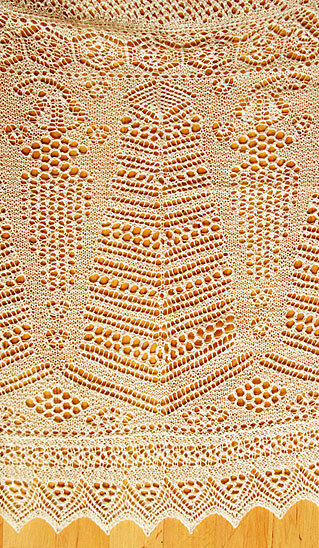 Hi Judit—I agree, lighter colours really show the patterns, which is why I tend to use cream for Hebridean ganseys, such as the one I’m knitting now. I started off a bit of a traditionalist—navy or conifer (the old conifer, which was more nuanced than the versions you get now) or cream—but having seen how well colours like seaspray, lemon yellow, or red work, I shall definitely get more adventurous in my old age! Stephen Hawking is indeed admirable, not only for his groundbreaking physics, but also for appearing in the Simpsons and Futurama.